In a previous post, I described a student named David who decided to “chase the river”–more accurately the series of brooks and ponds and rivers–that carried his backyard runoff to the sea. 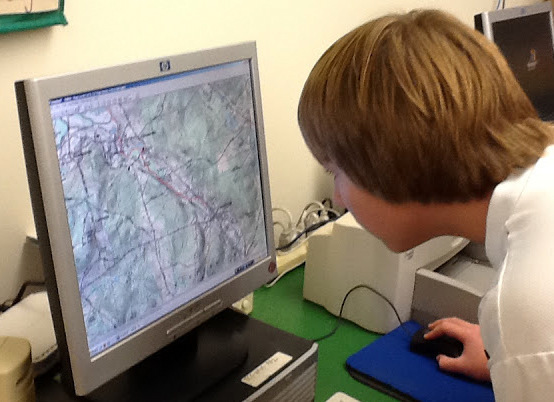 Many students after David found their own watershed pathways, working with the classroom set of topographic maps and other resources. Our distribution varied, from year to year, but we always had a fair number of students who lived in the school’s own watershed, the Blackstone River watershed, along with many from the Sudbury, Assabet, Concord and Nashua sections of the Merrimack watershed to the north, a few from the Charles River watershed, to the east, and a few from the Quinnebaug, to the southwest. Kids had all sorts of adventures following their watershed pathways, naming nameless brooklets and ponds, asking helpful neighbors what they knew, and playing in the mud. Once, when we were stumped, I made a house call. Marissa lived on the very top of a hill, typically a watershed boundary. According to the map, her front yard would drain into the Sudbury, and her backyard into the Charles. In actual fact, it all went into the street drains, whose outflow ran into a holding pond, whose outflow ran into the Charles. Not for anything would I have missed that rainy afternoon slogging around in rubber boots, peering down through street drains to be sure which way the water was flowing. Once a student had done his electronic tracing, he could ask the software for an elevation profile, and see how his pathway was all going downhill, except for a lake or a pond–a long flat stretch–or a place where a hand twitched and the path climbed out of the river briefly. To trace a pathway from brook to pond to river, then flip that path and see it from the side, sliding down the edge of the continent—that was pretty cool. If a small group of kids did this together, squeals and screams might erupt from their corner of the classroom, applauding the kid who just kept “sailing” down Narragansett Bay all the way to the open Atlantic. The group above, working with Terry Lunt, parent volunteer extraordinaire, is following the unfamiliar path of a classmate who lives way out in Charlton. Kids who shared the lower part of their pathways, what they called “the big river,” could meet together and see, for example, how much area was drained, by all their different routes, to become the power of the Blackstone, harnessed for the mills and re-channeled for the canal that gave the Blackstone Valley so much of its identity. Then what? The maps and their pathways could be put up in the hall for the rest of the school to see. Like a dare to everyone passing by: wherever you live, some story like this belongs to you. You can go find out, and you can get started with a map. Some years, students created posters to share with each other and parents at a special watershed night. Some years, we were even more ambitious, ridiculously ambitious. At the outset of Touchstone’s Older Student Program–supported by a state arts grant and with the help of a wonderful video consultant, Veda Reilly–Katy Aborn and I worked together to create a multi-part video called Voyage to the Sea. Voyage included documentary sections about topics such as the water cycle and water power, as well as story sections about two teams engaged in a regional competition called The Blackstone Watershed Relay. In the final chapter of the video story, Bill McHenry, then director of Touchstone’s Extended Day Program, posed as the director of the Watershed Protection Association, the fictitious nonprofit that sponsored the equally fictitious relay. Speaking to students who had become fired-up environmentalists as a result of learning about their watersheds, Bill repeated a quote from Bernie McGurl of the Lackawanna River Association, one of thousands of real-life organizations of people who have gathered together to learn about their watersheds and to protect the quality of the water flowing through them. Water has a voice. It carries a message that tells those downstream who you are and how you care for the land. Within those words, and within all these connected river-chasing experiences, there are lessons within lessons, like watersheds within watersheds: lessons about the ways learning is grounded and deepened and enriched by attention to place; lessons about everything that flows to us and everything that flows from us, and the responsibilities we share with others and to others; lessons about what we can learn from each others’ small views, flowing together to become a wide view; lessons about the power of the learning community. Or you can just put on your boots and head out the door. Don’t forget the map! 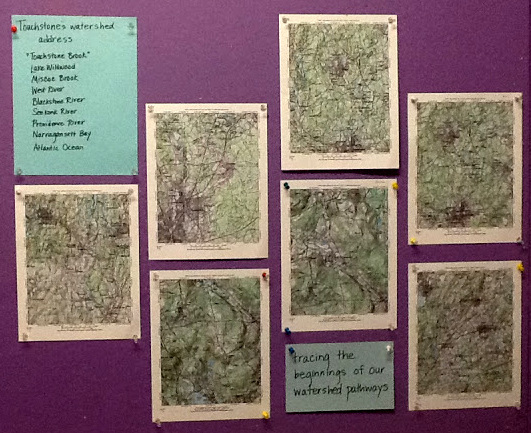 This entry was posted in Fieldwork, Place-based education, Science, Technology and tagged Bill McHenry, Blackstone River, Merrimack River, projects learning, Topo software, topographic maps, Veda Reilly, Voyage to the Sea, watershed, watershed pathway by pollybrown2013. Bookmark the permalink. I love the way this watershed stuff makes me think about my own place in new ways. And I love the mental image of the kids pursuing the storm drain flow. The substance of the lessons you’re writing about captures me, along with the reflections about the teaching process. In other words: look, you’re still teaching! Do you think we could do something with that software at the farm so we could follow the brook from where the springs rise near the beaver lodge, out through the pond, down past Betty’s bog, over the glacial mesa boundary to the Sandy River and thence to the Kennebec? Can we try?